Male, aged 42. When first looking at this patient’s tongue, I noticed a darkened feature in the liver region. I asked if he had bitten his tongue recently, and he said he had not, as far as he could remember. I described the lump I could see on the side of his tongue and he said it had always been there, but that it changed in size from time to time. I told him that the lump was located in the region of the tongue that reflected states in the liver, and the commonest condition the liver suffered was stress. The patient continued with regular maintenance treatments for years. He was a sensitive patient and was acutely aware of states in himself and was also very energetically sensitive. Not long after that first session, he told me that he had now made the definite connection between the size of the lump and how stressed he was feeling at any time, so much so that the lump was a reliable barometer of his stress. And in the maintenance sessions where he was initially stressed, the tongue lump always appeared pronounced at the start of the session, but by the end of the session was visibly reduced, and in those situations he would also confirm that it felt reduced to him. 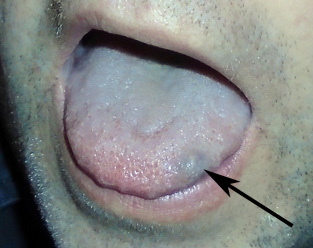 As Chinese medicine practitioners, we are used to associating any anomaly in particular tongue regions with states in the related organs (such as the body colour, the coating, dips or swellings in the body shape—indicating various organ states). But this anomaly was unusual, and certainly not one I have ever seen on any other patient. However, it was demonstrated that it clearly reflected states in the patient’s liver (rather than being due to some anatomical anomaly of the tongue, such as most moles on the skin appear to be). This suggests a rule of thumb: that any anomaly on a patient’s tongue may reflect states in the related organ, rather than this being restricted to the textbook anomalies we routinely interpret.